It takes a lot of time to design every little detail and program each and every feature and addition to the Mailbird experience. We thought it would be fun to share with you the different prototypes and designs for multi-account in Mailbird that many of you, especially our awesome alpha testers, were a big influence on. In this a very fine process, we put the user perspective in the forefront when deciding on the most intuitive, productive and beautiful design with your email interaction. 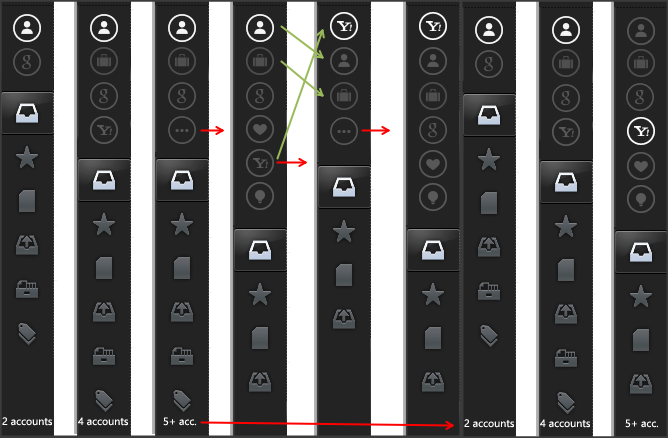 In the image below you can see our first idea for how multiple accounts would be displayed in Mailbird as a right expand bar when you mouse over the account icon. We quickly realized that this could get messy for heavy email users with more than eight accounts. Ideally, we also did not want to cover any part of the message list pane when switching between accounts. Below we experimented with a little color in the multi-account design with icons and letters for distinguishing between multiple accounts from one email provider. “Mailbird is a game changer, thanks for creating it and always making it better. You are making my life easier!” – Paul A. Here was the next round of designs for multi-account support where we are also experimenting with the size of icons and maintaining the current black/white/grey outline of simple icons to distinguish between accounts. We are also looking at how to indicate which account is active and whether or not to show the different accounts or to just show the active account. “I love the client and have been looking for something like it that appeals to me for sometime, so I’m excited as it comes out of beta and to see all of the changes. With Multiple Account support, Mailbird is now my go-to for email. So thanks for the great product.” – Brian D.
Next batch we experiment and test different icon styles and shading and some with 3 letter text to distinguish again between different accounts from the same email provider. 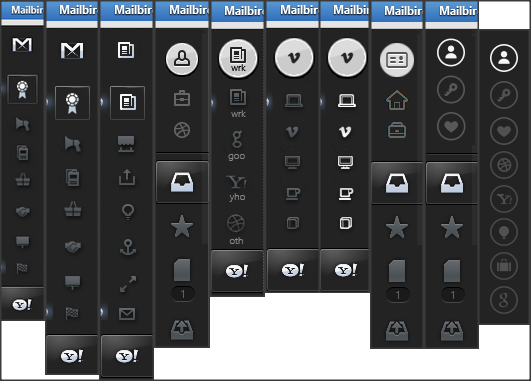 Here the idea was that a user could choose an icon that they would visually associate with individual accounts if they had five Gmail accounts. Even at this point as we started to narrow down the design choice, we still had to determine whether to show all account icons or have them collapsible. We still had to test and determine the best options for distinguishing between different accounts from the same email provider. What about how we indicate which account is active? Do we highlight it? Put a circle around it? How bright should the account selection indicator be? Still lots to do and a few days before the big multi-account beta update was to go live. “I didn’t know Mailbird previously but it’s a very nice surprise to discover such an amazing mail client under Windows. I used Thunderbird before but I definitely prefer Mailbird.” – Marc B. The next design obstacle was how to show the different email accounts when the far left navigation bar is expanded? Some of you may not know that you can do this, but give it a try. Click and drag the far left navigation pane in Mailbird to the right to re-size it for the expanded view of your email accounts and folders. Finally we had to determine what elements needed to be in place when you want to either show all your email accounts or just the active account. Our discussion rested on how to handle which accounts were shown if a user had 2 accounts versus if they had 10 accounts. One idea was to keep the most recent 3 accounts used active if a user had more than 3 accounts. Below is the design planning and mock-up. 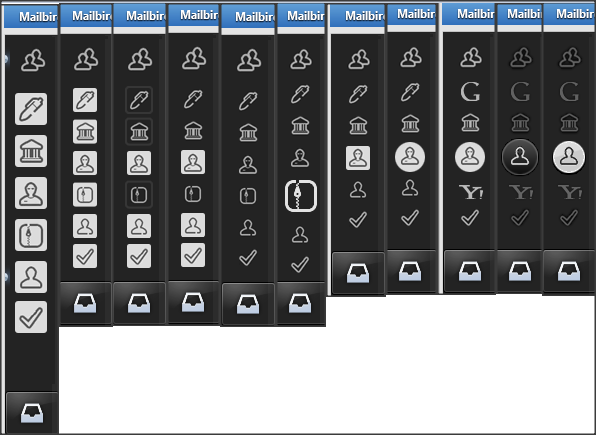 The evolution to illustrate the design process for multi-account support in Mailbird. 41 designs, lots of planning for multi-account seven months after the beta went public, testing, fixes, feedback and adjustments. So we know many of you were just as antsy as we were to get the feature out there, and there is a ton of work and attention to detail that goes into the design and development of a feature. This is only the front end design part of the process, there is a lot more involved from the back end side of the development which is what ultimately makes multi-account support in Mailbird work. Want to know what we finally decided on through this lengthy process? Give Mailbird a try, now with multi-account support and see how it all works. Another great thing from this launch is the fact that you all have been so engaged in telling us what you think and asking questions and making really great suggestions. One recurring request we realized is the zoom functionality, especially on newer high DPI machines like Windows 8 operating systems. 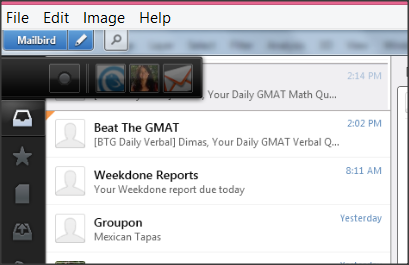 Did you know that you can zoom by selecting an email message and hitting CTRL + or – ? We also updated the zoom feature in the Mailbird options menu to adjust to your computers DPI setting. 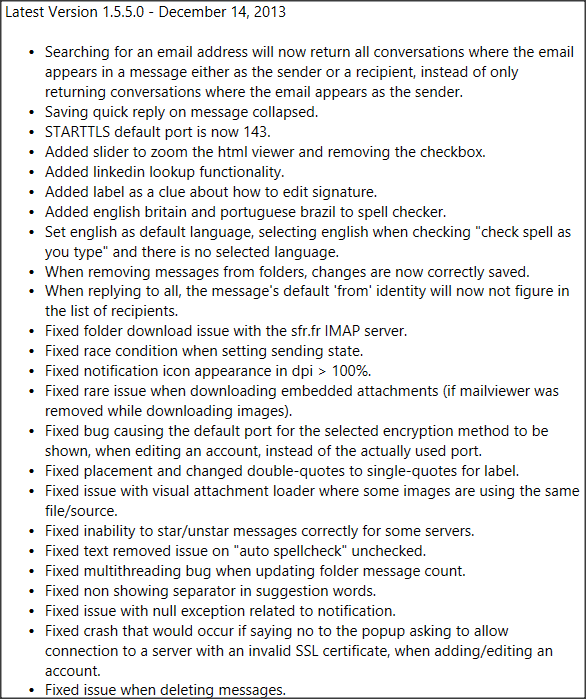 Thanks to your bug reporting in both the beta and the alpha we’ve been able to make 24 changes that we are currently testing in the the alpha version of Mailbird. What is next now that multi-account is released? We are working with people around the world in translating Mailbird by localizing with multi-language support. Also, we’ve heard from a lot of users who want to install Mailbird on their computers at work or in the office but are unable to because their network runs on a proxy server. We will soon have proxy support for you. In addition to this, we will also be supporting POP3 email accounts due to an increased request for it since the IMAP launch. Finally, we will be releasing an optimized version of multi-account support that is faster and with a unified inbox experience. We are shooting to get this all done in the first quarter of 2014. Then the ultimate email productivity booster, the Mailbird Wingman will be under way. After that we’ll be working on the open API for the Mailbird Birdhouse apps. We are very honored to have had Microsoft feature Mailbird as the startup of the day on Tuesday December 17, 2013. Additionally, Mailbird is now listed in the Windows 8 app store (English version only) where you can also rate and give your review. This is a huge milestone for us and also we want to share Mailbird with your friends and colleagues by inviting them directly from the Mailbird drop down menu in the app and selecting “Invite Friends” in order to get 25% off Mailbird Pro or Mailbird Pro free for 1 full year. Give the gift of productivity with Mailbird today. 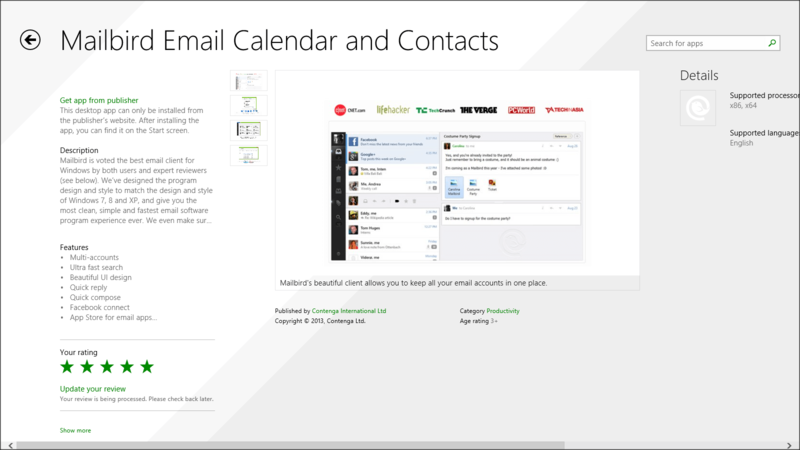 Mailbird in the (English) Windows 8 app store. 2014 is going to be an awesome year for email users around the world with the Mailbird email experience. Until next time, many warm greetings from the Mailbird team, wishing you a happy holiday and a wonderful new year! 11 thoughts on "The Evolution of Multi-Account in Mailbird"
This really is amazing.. It must be a true honor to be on the team and working with such talented people. There are definitely products out there that have been in dire need of a change. Using the same apps over and over and over gets boring. You have definitely changed all that. Keep up the great work! Also, I extend very happy holidays to all of you and a very happy New Year for Mailbird. I cannot wait to see what happens next! The good stuff is still yet to come like the Wingman productivity booster and the Birdhouse apps. I think that is what Vycke above will be most excited about too. As a real Gmail fan I was looking for a emailclient that would give me the same experience as Gmail, but with the possibility of multiple accounts (and not only working with labels in Gmail). You guys, made my day when I read about Mailbird. 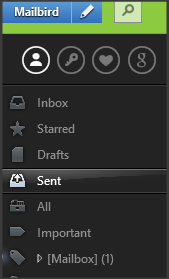 I just found Inky as an emailclient, but I was missing something. You have a more mature interface (which I really like), but that wasn’t it… The apps you have in your Email client are just wonderfull! I’ve been searching everywhere to find an emailclient with Google Calendar integrated, so you guys rock. Furthermore, it’s really interesting to read your process to multi-accounts, and you’ve done a great job. I’m also very pleased to read your future plans and I’m definitely going to try and help translate the Dutch language. Keep up the great work! Thanks so much Vycke! It’s only going to get more awesome once we build the API for Mailbird so we can build the platform for productivity apps baked right into Mailbird. You are going to love it! That would be so awesome if you could help out with Dutch translation too 🙂 If you haven’t already, fill out the “Other ways to help” form here http://www.getmailbird.com/donation-2/ and we’ll be in contact with you. You guys didn’t do the icons right. You should have kept it as the emails picture, not as some random baked-in icons you have. i believe this is not the negative part of my opinion. icon/ui design in general are tricky. trending/beautiful design not usually the most usable or easy to understand in a snap. Even the users never know it, or agree with, it contributes to their +/- experience and decision making. I made a comment on the blog at the previous post (regarding the launch). Could you add letters or short names (like that “wrk” one)? I have multi accounts. A lots of them. And I can’t possible learn all the images. It would be really silly in this situation. Is there a date set for the POP3 launch? 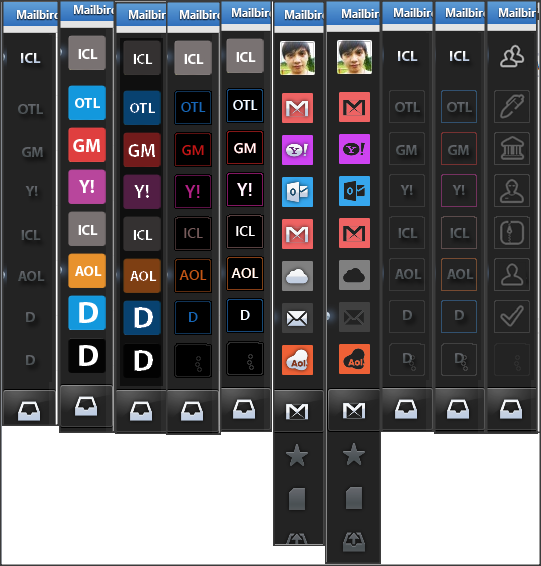 Have you ever thought of a sub-project to make a metro app out of mail-bird for windows 8 and even for windows phone. It would be really great. thanks anyway for your great works!! !